This past weekend yours truly blindly leapt at the opportunity to participate in the Gran Fondo Leavenworth, an 87mile loop in Chelan County, in central Washington state put on by Vicious Cycle Event Promotions. Now when I hear the term “gran fondo”, I think of mobile fashion parade of lycra-clad fanboys vying to be on the next cover of Bicycling Magazine ™ with a newly purchased Pinarello Dogma. 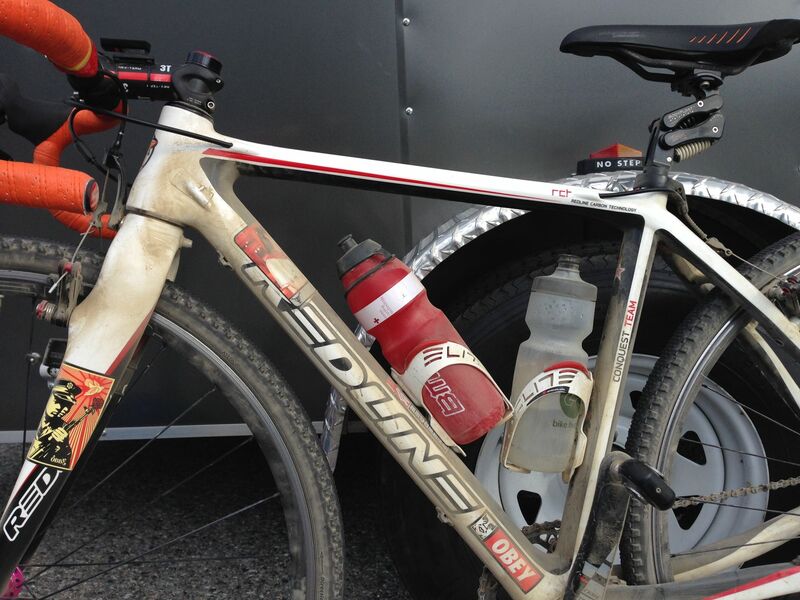 But with 45 miles of primitive, unpaved roads and 9400ft of climbing, the Gran Fondo Leavenworth is actually a very challenging “gravel grinder”….a detail that hadn’t really been evaluated before I hitched a ride to Leavenworth on Saturday afternoon. With virtually no long-distance mileage and no advance notice to select any special equipment, I only had time to wash and lube my Redline Conquest before I met up with my ride. Luckily I did have what turned out to be nearly ideal wheels/tyres for the event, Hed Belgian Plus rims laced with Sapim CX-Ray spokes to White Industries hubs and shod with Kenda Happy Medium tyres. Normally when I roll out my cyclocross bike for a big day, it’s atop a set of tubular wheels. My fall season CX wheel selection consists of a mud tread front, a medium conditions rear, and a mud tread rear, which gives me decent options for most of the CX races in this area. But I had been thinking about doing “gravel grinder” events, and destroying my expensive tubulars on sharp rocks in the middle of nowhere was unacceptable. 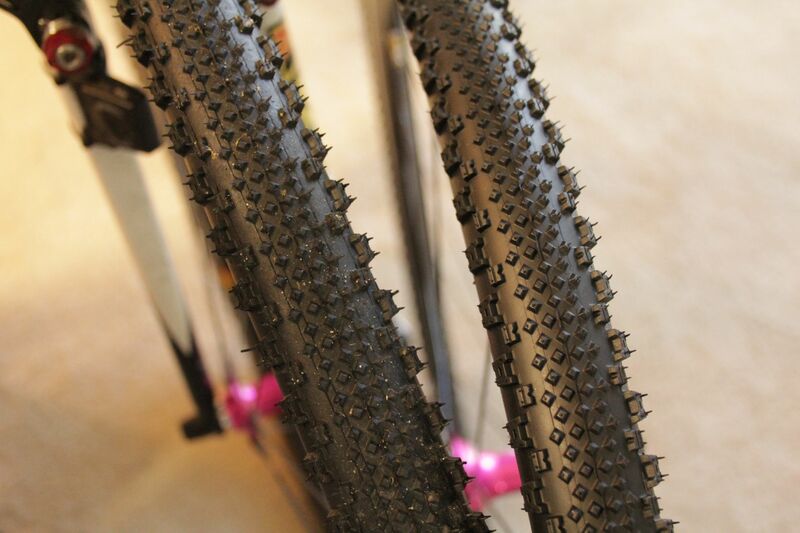 What did seem appealing was tubeless clinchers for such events, even though I’ve committed to tubulars for CX racing. I feel that CX tubulars still beat out tubeless clinchers when run at the really low air pressures (22-28psi) I use for CX racing when traction and tyre suspension are most important, but that advantage is largely eliminated when you run 40psi or more for reduced rolling resistance in the longer distance events. I already run sealant in my tubulars, but if the hole is too big for sealant to clot, a tubeless clincher could be inflated with a regular tube installed. Whereas, a tubular with the same damage would leave one with two choices: ride it flat and totally destroy the tyre and maybe the rim, or walk it to the nearest sag station (typically no wheel pits at these rural road rides). My transition from clincher to tubular CX tyres was rather quick, since all my personal clients who race CX were already on tubulars and I lucked into a good deal on some tubular wheels halfway through my first season. As a result, CX clinchers for dry conditions were barely on my radar, particularly since the cyclocross conditions I typically see are wet and muddy. The Kenda Small Block Eight, as a stock tyre on some mid-priced complete CX bikes, has a good reputation as a performer on dry, hardpack, but after looking at some other options in the Kenda catalogue, I opted for the Happy Medium. The HM has a similar density of low profile knobs down the center but has two rows of rather more aggressive, rectangular knobs on the shoulder. To me, it looked like it would have better bite when leaned over on softer surfaces than the Small Block Eight, at the expense of some cornering ability on hardpack. In effect, I was wagering that I wouldn’t be cornering hard on the road while I might use these wheels on some early season CX races where the corners might dry and loose. 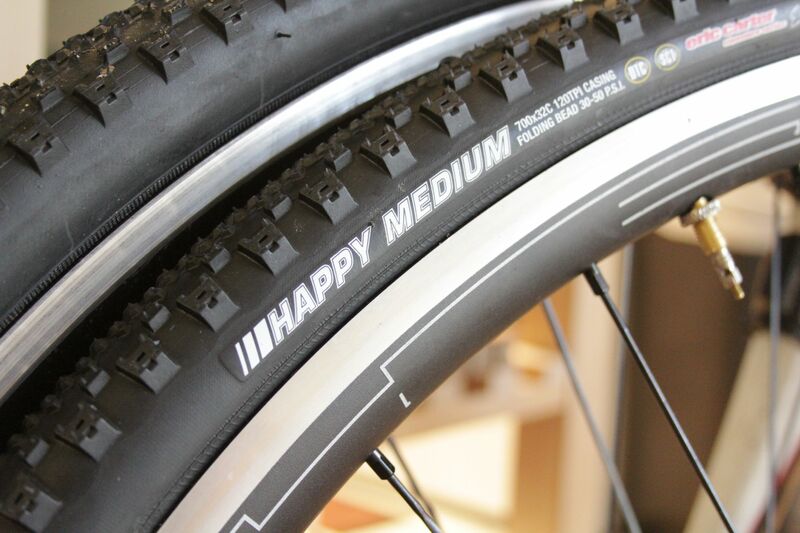 With an eye towards possibly doing gravel grinders and the knowledge that I don’t race UCI events that would enforce the 33mm max width tyre limits, I chose Happy Mediums in 35mm width. However the Hed Belgian Plus rims have a 25mm external width (~20mm internal), which loosens the belt on those Kendas to balloon out to 38.5mm….too much for practical tyre clearance on rear of my Redline Conquest. I switched to a 32mm HM for the rear (which mounted up to 35mm on the Hed rims). Another quirk about my tyre combination is that I inadvertently ordered the non-tubeless version of the 35mm and the SCT (tubeless) version for the 32mm. Mountain bikers have been using non-tubeless approved tyres in tubeless conversions for years because the tubeless versions of the same tyres are typically heavier by a noticeable margin. This holds true for the Happy Medium models. The SCT version is also a much stiffer sidewall. While descending the rock-strewn doubletrack roads of the Gran Fondo Leavenworth, I decided that I had the optimal combination: stiffer, more durable tyre on the rear to ward off flats and sidewall tears and a supple front tyre for a suspension effect and assertive changes of line. It was a judgement call, but I chose to run slightly higher pressure on the rear than I normally would have, because I had a suspension seatpost. I wanted to have a bit less rolling resistance, but the trade off was less traction on the gravel climbs. In short event like a cyclocross race, I would have lowered the air pressure to the point that I could climb and sprint out of the saddle on the loose stuff, but you’d suffer from the rolling inefficiency on a longer event like the gran fondo. On those events, you’ll need a low gear so you stay seated and climb steady with your weight firmly on the rear wheel. Unfortunately, this is where my bike was ill-suited for Leavenworth. In terms of equipment, that was the biggest problem with my setup, that I didn’t have time to change my 1×10 to something that would allow me to climb at a comfortable cadence. I have a naturally high cadence, and my legs bulked at slowly torquing the cranks over at mile 31. I suspect that nutritional strategy, or lack thereof, played a roll too; the cramping in my hamstrings and quads only got worse over the next 56miles. There was nothing I could do but soldier on in no-man’s land. However, the descents were fantastic. I passed people on full-suspension bikes and saw a number of riders to the side of the road with flats or bleeding from crashes. Those wheels felt bomb-proof. The tyres hooked up well on the dried clay ruts and the loose over hard; the extensive siping on the shoulder knobs and soft-ish rubber compound supplying grip on where the knobs themselves couldn’t dig in. There was one hairy section like a washboard that I came into at over 33mph under hard braking when I realized I would not be able to bank for a turn and stay upright because I was just rolling on the rocks as if they were ball bearings, but the bike settled down just in time for me to commit to the turn. If I am to ride more rides like the GFL, I will need either lower gears that aren’t as optimized for CX racing….probably a 2×10 drivetrain instead of 1×10. I was thinking a crank like the Sugino OX601D with a 44/30 ring combo and 11-32 cassette would be ideal for my style of riding. If not that, then I’ll use my old CX double of 44/34 and see if I can’t fit an 11-34 or 11-36 cassette on the back. I know disc brakes are all the rage, but I personally can’t replace all my wheels for what is…for me…only a marginal improvement. Tyres are where performance really lies, I can make up for less-than-cutting-edge brake systems with chutzpah and technique. Whether I modify my Redline for gravel grinders or build up a specific bike, I know that I’ll be using the Kenda Happy Mediums. I only have about 300miles on these tyres, so I haven’t yet formed an opinion on their wear resistance. Those descents in Leavenworth were somewhat extreme, so I’m actually surprised I don’t see more wear. I’ll hold off till I later for a final evaluation. Also, depending on the weather for the early fall, I may get a chance to review the Kendas in actual CX racing. Check back then.